The Capital Region is full of cities, towns, villages, and hamlets. And some of these places -- like Albany or Saratoga Springs or Troy -- get lots of attention. This series isn't about those places. It's about those other spots -- the "in-between" places. Next up: Mechanicville and Stillwater -- a city and town (and village) alongside the Hudson in Saratoga County. If you haven't visited in a while, or ever, here's a quick look at the side-by-side river places. 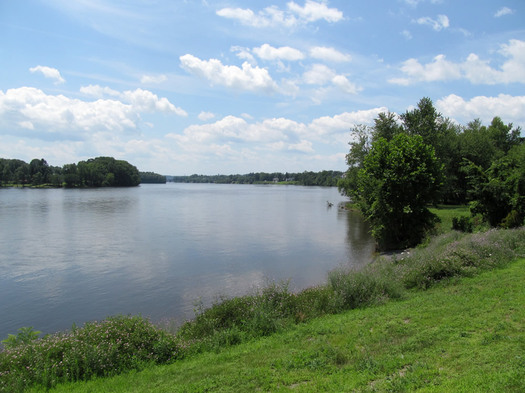 Eastern Saratoga County, along the Hudson River, the town of Stillwater to the north (which includes a village of Stillwater), the city of Mechanicville just the south. If you draw line due west from Mechanicville to the Northway, it'd mark roughly the halfway between point between the Twin Bridges and Saratoga Springs. US Route 4 runs north/south through both Mechanicville and Stillwater -- as Central Ave in Mechanicville, and Hudson Ave in the village of Stillwater. + The city of Mechanicville is just .84 square miles. It's the smallest city, in terms of area, in the state (according to figures from the Census Bureau). + Median age: Mechanicville - 37; Stillwater (town) - 41. + Median household income: Mechanicville - $39,668; Stillwater (town) - $71,909. + Average commute: Mechanicville - 21.9	minutes; Stillwater (town) - 28.2 minutes. Stillwater was established as a town in 1791 and a village in 1816. But it was in 1709 that Peter Schuyler built the first fort there, recognizing the need to protect the river landing. In 1777, during the Revolutionary War, Stillwater was the site of the famous Battles of Saratoga (both of them), regarded as a turning point in the American Revolution. Stillwater was also the birthplace of Abigail Fillmore, wife of President Millard Fillmore. 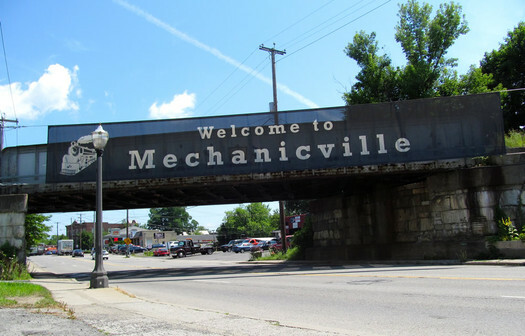 The name Mechanicville comes from the millers, carpenters and butchers that settled the area. Back then, those trades were known as "mechanical arts." Mechanicville's shining moment was during the Industrial Revolution as a hub for railroads, factories, paper mills and a part of Erie and Champlain Canal systems. In 1897, a hydroelectric plant was built there to take advantage of the Hudson River. It supplied electricity to GE to in Schenectady -- one of the plant's designers was Charles Steinmetz. It's said to be the oldest continuously operating hydroelectric power plant in the United States. (Though apparently it was turned off during a dispute between Niagara Mohawk and preservationists in 1997.) It's still operating today. With the decline of the railroad, local industries eventually failed or moved and Mechanicville became a residential community. The Hudson River at Stillwater. 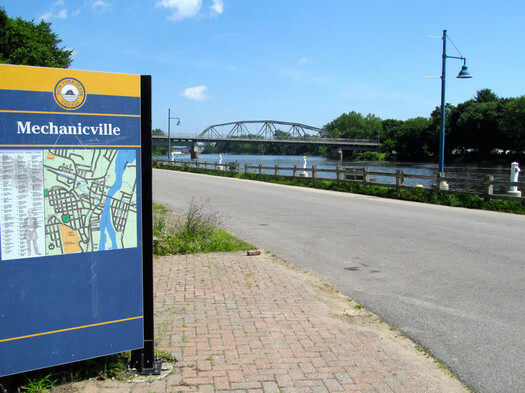 Mechanicville and Stillwater are no longer strongholds for armies or militia, but they are pleasant spots along the river. Mechanicville is the busier of the two, with most of the restaurants, supermarkets, and other conveniences. And Stillwater village can be summed up in one word: waterfront. Most houses have a lovely large porch, or a deck that overlooks the Hudson River. There's even a waterfront dentist office and a marina with its own bar. + The Saratoga National Historical Park is in Stillwater. It's a reminder how important the area was in the American Revolution. It's also great for cycling, cross-country skiing, and impressive views of the Hudson. + Lock 4 State Canal Park isn't actually in Stillwater -- it's just across the Stillwater Bridge in Rensselaer County. 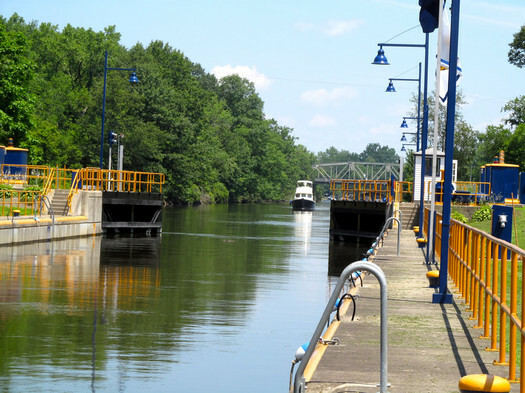 It offers pathways over and around Lock 4 to watch boats heading up to Lake Champlain or down the Hudson. Locals bring a picnic and watch the boats go through the lock, which is interesting to watch. It's open when the canal system is open, usually May 1-November 30. + Stillwater Wood has been in business for over 39 years. It's a woodworks shop where you can buy unfinished furniture. + Blu Tea Company recently opened in Mechanicville and offers a comfortable tea house to those looking for an oolong. + The Mechanicville Country Living Center is another interesting shop down the road. There you can get hardware, rent lawn and construction equipment, or just any little thing for a weekend home improvement project... but it's also kind of a pet store. They have chicks, lizards, goldfish and geese. It's a one-stop shop of sorts. 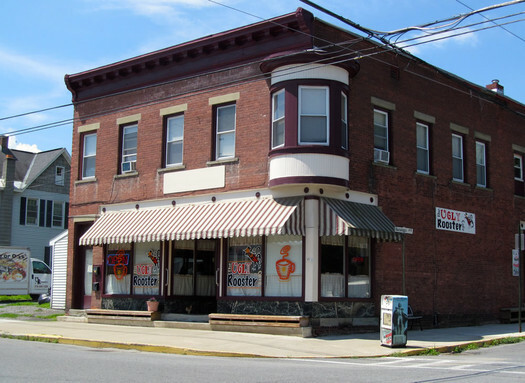 + The Ugly Rooster Cafe, Mechanicville: Home of the Colossal Pancake Challenge. They also offer other non-pancake food. It's a funky place known for its breakfast menu. + Bubbles Restaurant, Mechanicville: a mainstay for summer. Not only can you get a homestyle meal, but the ice cream stand is right next door! + Faldoni's Deli, Mechanicville: a small deli in the heart of Mechanicville. Amy Mengel of Stillwater adds: "My husband is from Philadelphia and he says their cheesesteaks are the real deal." + Tour de Stillwater Pizza: Stillwater features three pizza places within two minutes of another of the main road, Hudson Ave. If you're up for pizza and a nice stroll, try a slice at Dom's Pizza, head to Frankie O's Pizza and Pasta, and then finish your tour at Moreno's Pizza. Mechanicville is ITALIAN.Â We learned this when we were moving into our house in mid-August, on what turned out to be the Feast of the Assumption. This is a big deal. Every house was flying an Italian flag. Canon-blast fireworks started going off in broad daylight. (This is theÂ home of the Alonzos, after all). We had no idea what was going on or why we were under siege. I think we even got stuck in the middle of an Assumption parade. I vaguely remember a tuba. 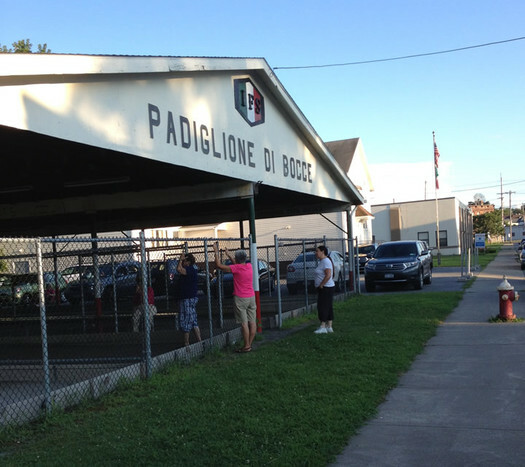 MechanicvilleÂ has a Padiglione di Bocce; not a bocce pavilion, a padiglione. Both places are full of good hearted, hard-working people. There's no fanciness or pretense. Another thing in Stillwater which is awesome - Damn Good Jerky. And, in Mechanicville - the White Water Derby is the first weekend in April and is usually amusing, especially with their anything-that-floats competition. There's also a duck derby (with floating ducks with numbers on them which determine who will win a raffle in the early summer). Great idea for a series. I'd actually had a similar idea for a blog recently, but ya beat me to it, man. The CD is full of very interesting nooks and crannies...hope to see more of this series on here. If you want to go a little further out next time I suggest covering Hudson or maybe Cobleskill. Thanks Mary and Greg --- This is our hometown and we still love Mechanicville - what a great place to grow up - we had such freedom and became independent kids in a safe environment - it would be interesting to research the high achievers who came from our town - Col. Elmer Ellsworth, a personal friend of President Lincoln and the first Union casualty in the Civil War - Ray Heindorf, an Oscar winning Hollywood musical director, Kentucky Derby winner Funnycide's breeder of record, Joe McMahon, is from here as is current top thoroughbred trainer, Chad Brown! Come on fans, Who Else? I remember all these sites , great little town. The Village of Stillwater. Also has The Blockhouse, that was originally part of the Saratoga Battlefield until the Federal Government took over. They said it wasn't an authentic part of the Battlefield and moved it to a vacant field across the road. I can remember my Father Dave Mehan saying I suppose those concrete building they built are authentic. After many years .money and work the Blockhouse was moved to the Village of Stillwater. The entire city and surrounding towns get involved in FAMILY DAY. It's always the 1st Sunday after July 4th. Massive fireworks display (Alonzo's), vendors, food, drinks, games, etc. It's an all day family event! Casey, like my wife and me, you live in a little community called Frog Island. You say, "I live on Frog Island between Stillwater and Mechanicville. Nice article. Have lived there. It surely has changed a bit. You might have included some of the more historical data and culture of both places. There certainly is a WASP (no intent to be pejorative) and Irish heritage in Mechanicville that deserves mention. Also some of the Victorian architecture which abounded at one time is worth a look. I hope some of those homes have been preserved. In Mechanicville, Collins Flower shop is the oldest business opening in 1900. Pat's Subs on Hudson Avenue in Stillwater is the best food place in the village and been there longer than any other. Its food and prices are great and so are the owners. If you haven't been there, give it a try, I guarantee you will like it. "I always struggle when someone asks me where I live -- which should I say?" Stillwater. The USPS does not dictate municipal boundaries. Are you listening Colonie residents who think they live in Watervliet?